The Masters. 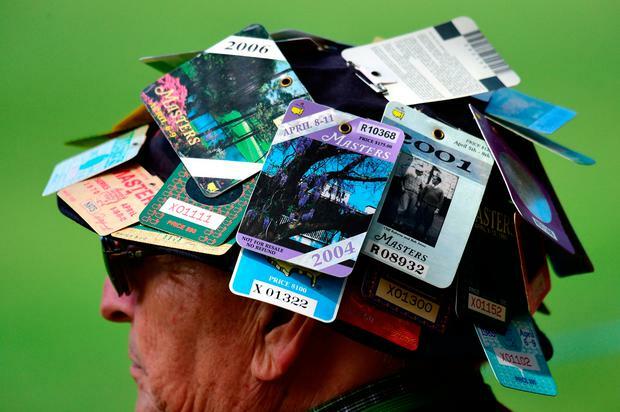 A tournament in which players are "invitees", spectators are "patrons", and members of Augusta National Golf Club present the Masters to a standard of excellence which demands constantly evolving improvement. It's so different to any other tournament. No branding anywhere, not even on cups which contain soft drinks. No giant TV screens, no tented village. Around the tee-boxes, just a rope separates the players from the patrons. No running. Courtesy and decorum is expected at all times. Phones, beepers, any electronic devices are prohibited. No excuses. Breach that rule and you're out. Tradition counts for everything here. It may sound schmaltzy but great golfers feel honoured to be here, and so do the patrons. 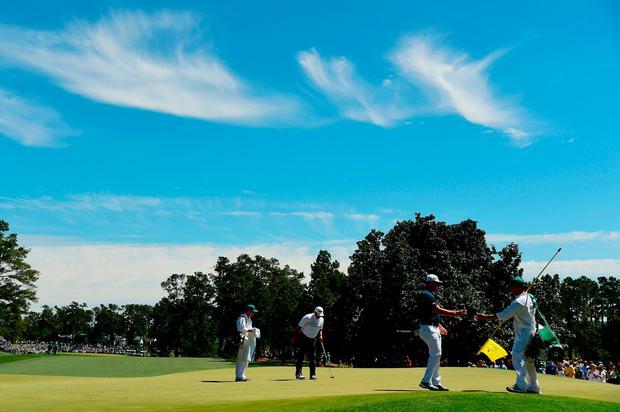 This is a diary of the seven days leading up to yesterday's finale at Augusta. Arrival day. Greeted by smiles and 'welcome to the Masters' by the staff. Pass through security and there in front of us is the amazing sight of a building that did not exist a year ago. The new Press Building. A huge, elegant structure that would grace any five-star hotel, and built in just six months. I take myself out to the Big Tree area where winners of the Drive Chip and Putt Championship for kids aged 7-15 receive their prizes. Masters champions Ben Crenshaw Bubba Watson and Zach Johnson are among the stars making the presentations. Grab a chat with them. They could not be more helpful. Turns out there's an Irish connection. Kildare native Derek Murray, of Fore Golf, former World Clubmaker of the Year, is a member of the team that looks after the DCP contestants when they arrive via Magnolia Lane. A privilege for the kids - only players and members get to drive up Magnolia Lane on Masters week. Yes, it's true. The Masters pricing of food and beverages for patrons is extremely reasonable. You could have an egg salad sandwich for $1.50, a Masters club sandwich for $3, a soft drink for $2 and beer costs between $4 and $5. In the thronged merchandise shop, a cap is $26, 2017 Masters flag $25, golf shirts cost between $69-$79, and an umbrella $45.Those umbrellas were highly popular when the first storm of the week rolled in around 12.0pm. The patrons had to evacuate and were let back in at 1.45pm, but by 2.30pm the course closed. As the rain hammered down, Irish reporters interviewed Shane Lowry in the shelter of the clubhouse porch. Pádraig Harrington, here on Sky Sports duty, showed us the scar on his throat through which the surgeon went to get to the back of his neck to work on a disc problem. Ouch! JP McManus and AP McCoy were with Harrington. 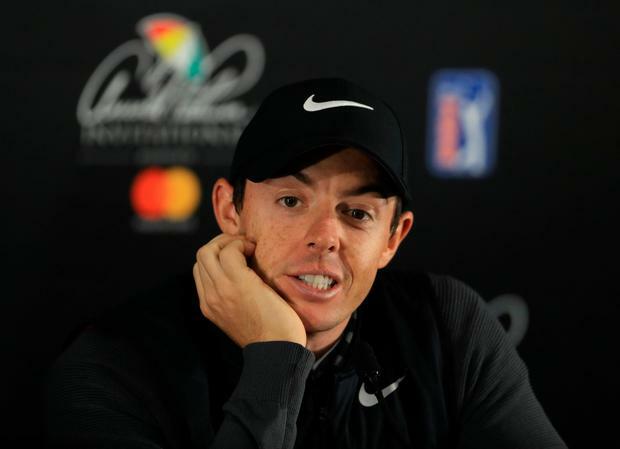 Rory McIlroy's interview. All going well until the World No 2 (left) gets a slam dunk question about his recent round with President Donald Trump. It's not going to go away, is it? But he deals with it, albeit a tad uncomfortably, and we move on. Danny Willett's Champions Dinner menu is revealed: "Sunday Roast, Apple Crumble, Coffee and Tea." I go out and watch some of Rory's practice round. He's with Sergio Garcia and Adam Hadwin. On the way down the 10th, groups of patrons break off and go into the trees on the right where Bubba Watson hit an epic shot in the 2014 play-off. Unfortunately the severe storms forecast blast in that afternoon. The Par 3 Contest starts but is later abandoned and the course evacuated. What a disappointment for people who travelled from all over the world with a one-day pass. Later comes the shock news that Dustin Johnson has hurt his back in a fall on the stairs of his rental home. He's now doubtful to play. At last, the Masters begins. I'm in place at 7.0am for the 7.40am ceremonial drives by honorary starters Jack Nicklaus and Gary Player. Masters chairman Billy Payne pays tribute to Arnold Palmer. It is an emotional moment, particularly for Nicklaus and Player. Both shots hit the fairway but Nicklaus, who muttered 'here goes nothin' before setting up to the ball, has the edge in distance over Player. The course plays tougher than usual in strong winds and chilly temperatures. Johnson withdraws shortly before his 2.0pm tee-off time. McIlroy and Lowry shoot level-par 72. Charley Hoffman carves out an amazing seven-under 65. "Unbelievable," says McIlroy. Willie McGirt, 37, a Masters debutant, is second on -3 (69). Brrrr! Cold again. Blustery winds. Tough day at the office for many, and disastrous for Lowry. He shoots 79 and misses the cut by one miserable shot. So does holder Danny Willett. Veterans Larry Mize, 58, the 1987 winner, and the ever-popular Fred Couples, 57, who won in 1992, go through to the weekend. McIlroy is on +1, and Hoffman, Garcia, Thomas Pieters and Rickie Fowler hold the joint lead on -4. At last, typical Masters weather. Sunny, warm, light breeze. Let the birdie-fest begin! I follow along with a huge throng of patrons, including many Irish, in the McIlroy gallery. We nod at each other, and share knowing looks. He's on his game, and in the mood to make a move through the field. It's going to be a bit special here today. Well…you know the rest. McIlroy stalls on level-par by the end of his round, six shots off the lead. "I just have to go out there and play the round of my life tomorrow," he says. Justin Rose and Sergio Garcia share the lead on -6. Jordan Spieth lurks on -4. He's buzzing. "I've been on both sides of it now, and I like the winning side better. "So I'm certainly going to go for broke tomorrow," says Spieth.